What a perfect combination. My assistant came back from a day trip to Napa, enamored with the bubbles and oysters she indulged in at Domaine Chandon -- a touristy winery known for its California sparkling wines. 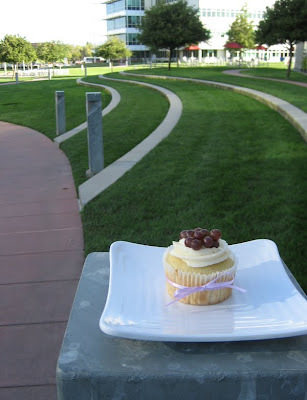 With champagne grapes in season, I was inspired to whip up a test batch of champagne cupcakes, which my assistant happily took on a spontaneous outdoor photoshoot. 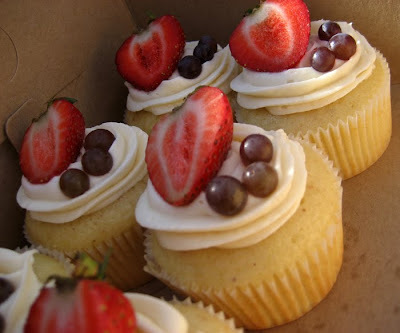 Champagne, cupcakes, and sunshine -- what's not to love? 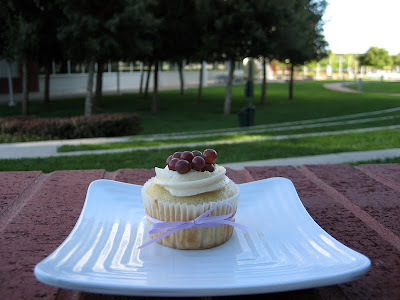 Because I'm all for alliteration, I'll call this the Chic Champagne Chiffon cupcake: a fluffy chiffon cupcake flavored with vanilla and champagne, topped with a cloud of champagne buttercream and a small cluster of champagne grapes on top. What's missing from this photoshoot? A chilled, sparkling glass of bubbly. Clearly! Well, this lucky cupcake got the star treatment: a fancy ribbon bow, fresh air, a bit of first-class travel atop a fancy plate... Its comrades weren't as lucky, as they were quickly gobbled up by champagne and cupcake enthusiasts. Cheers to enjoying these last days of summer, from the warm air and sunshine to all those beautiful, sun-ripened summer fruits and berries that'll be gone before we know it. So enjoy 'em while they last! Clink. While I have a whole lot of love for classic layer cakes and old-fashioned bundts, there's something about the sweet little cupcake that sends my excitement through the roof. 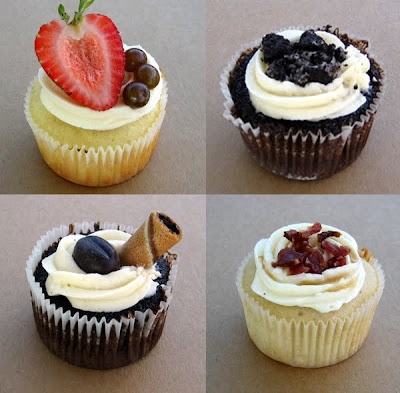 As a creator rather than consumer, I'm guessing it's because the petite cupcake gives me the opportunity to experiment with wilder flavor combinations that I may not be able to get away with in a larger cake. 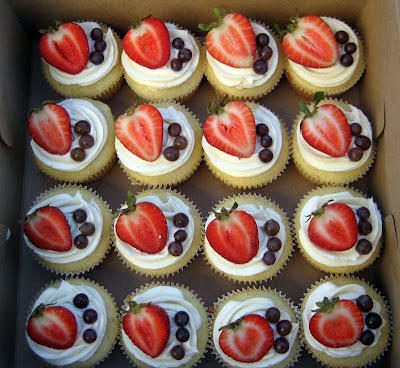 Well, being imaginary, I like to think I can get away with anything ;) But...out of love and respect for my very real assistant and her role in a real world with real consequences, have no fear: you won't see any white chocolate Tabasco and sardine cupcakes coming from my kitchen anytime soon. 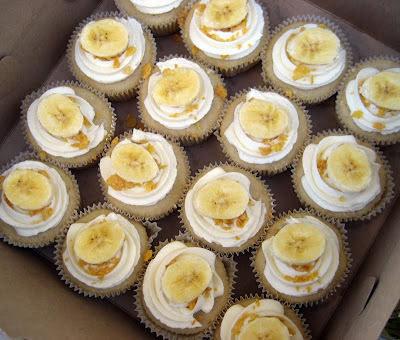 I was very excited when Anne ordered four dozen cupcakes for Robin's going away celebration, giving me the freedom to experiment with frosting and cake combinations as long as I kept them fun, tasty, and included Robin's favorite. 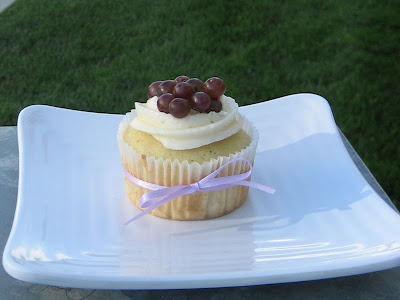 Lightly nutmegged muscat wine cupcakes topped with tangy cream cheese frosting, a fresh strawberry half, and three tiny champagne grapes. The Muscat Musing is definitely fruit-forward. 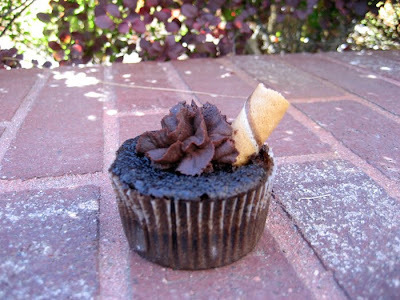 A dark chocolate cupcake rich with cocoa and topped with a decadent bittersweet ganache swirl (imagine biting into a dense, chocolatey truffle) and a chocolate cream pirouette cookie. 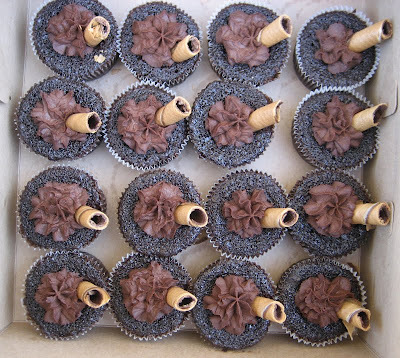 Chocolate addicts, have no fear. Your delicious and antioxidant-packed hero is here. 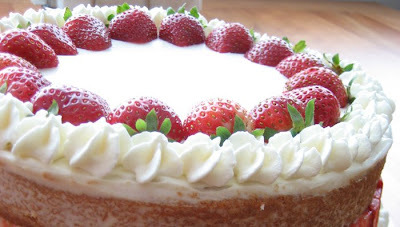 A bourbon buttercake with Maker's Mark poured generously in the batter and another sweet surprise: a vanilla pudding filling packed in the cake itself. 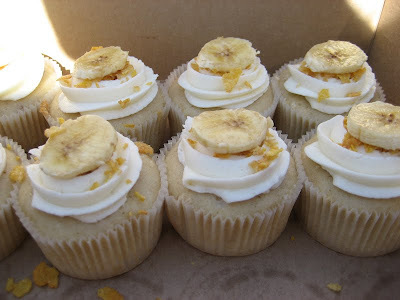 The filled cupcake is then topped with bourbon buttercream, crushed cornflakes, and a fresh banana slice. Think of it as spiked milk and cereal with sliced bananas on top. Now that's a breakfast of champions! 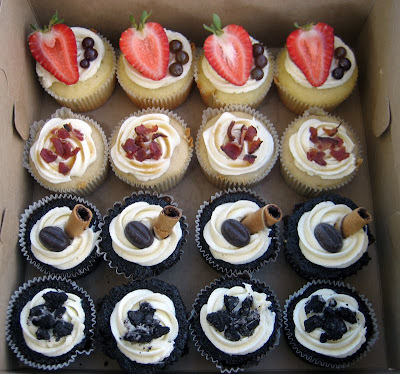 Thank you, Anne, for the opportunity to go cupcake crazy. And Robin, you will be missed! Best of luck to you on your next big adventure! Oh boy, it's been far too long since there's been a post around here. It's already August and you know what that means: plenty of gloom and fog in the inaptly-named Sunset District of San Francisco where the sun goes into hiding until September. Well, all the more reason to turn the oven on, warm the chilly kitchen, and bake up a storm. And my assistant did just that on a chilly morning. Finally! 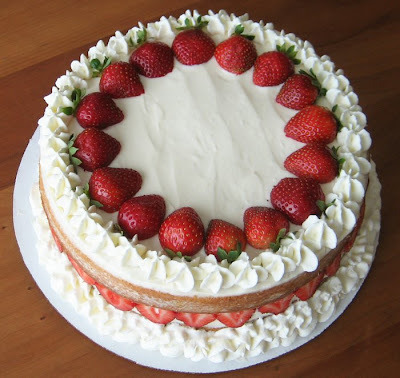 This, ladies and gentlemen, is not your average shortcake. 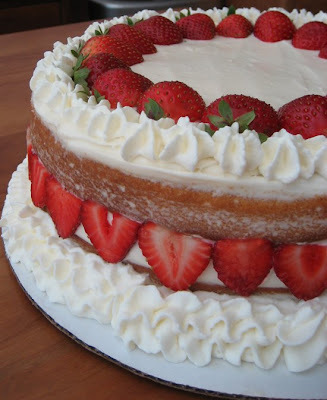 Nope, it's two layers of buttery rum cake filled and topped with tangy cream cheese frosting, too-cute baby strawberry halves and slices, and decorated with two borders of fluffy vanilla-infused whipped cream. Being smart and sassy, this strawberry sweetheart sure loves the limelight. And for good reason, don't you think? 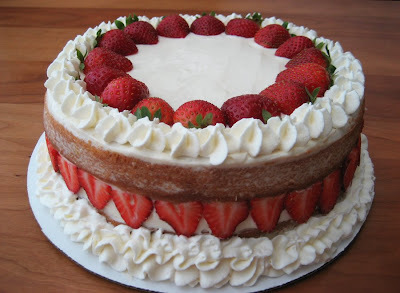 Happy birthday, Auntie Betty! As a guest at the party, my assistant (who did not feel the need to bring me along... Where's the love for us imaginary folk?!) 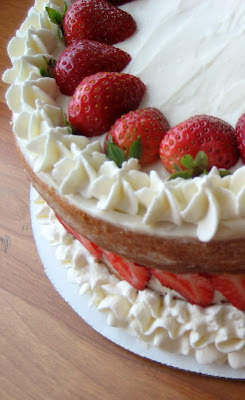 can confirm that while this cake is busy--as the smart and sassy often are--the flavors work together quite nicely: the tangy cream cheese frosting balances out the flavors of the sweet, juicy berries, while the light, airy whipped cream provides a delicate contrast against the rum-infused cake layers--cake layers that leave an ever-so-slightly spicy and boozy finish on the palate.